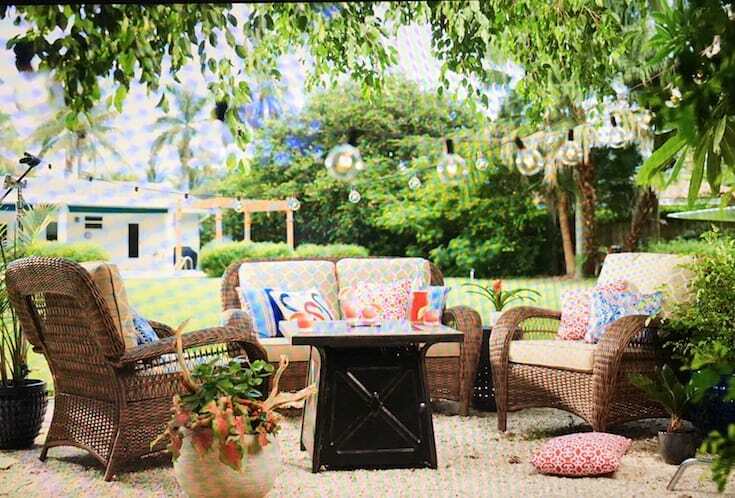 Today I’m excited to reveal the patio style challenge with my friends at The Home Depot! My pool and patio are always a work in progress and if you follow me on Instagram you’ll see more right now on a big project going on right now. I’m really thrilled that we have a new area to relax in by the pool. Before I get get started on that I thought that I would share an older photo of our patio space. We had upgraded our canvas gazebo to a nicer composite trellis gazebo awhile ago, and it doesn’t have to be replaced every day like the old one did. The sun and humidity are so harsh here that they can destroy outdoor items quickly if the quality isn’t good. Those sling chairs eventually broke and we needed more shade for lounging after a swim. The Home Depot came out to our home with a full crew back last summer to do a shoot for their website. I had so much fun styling it for them! 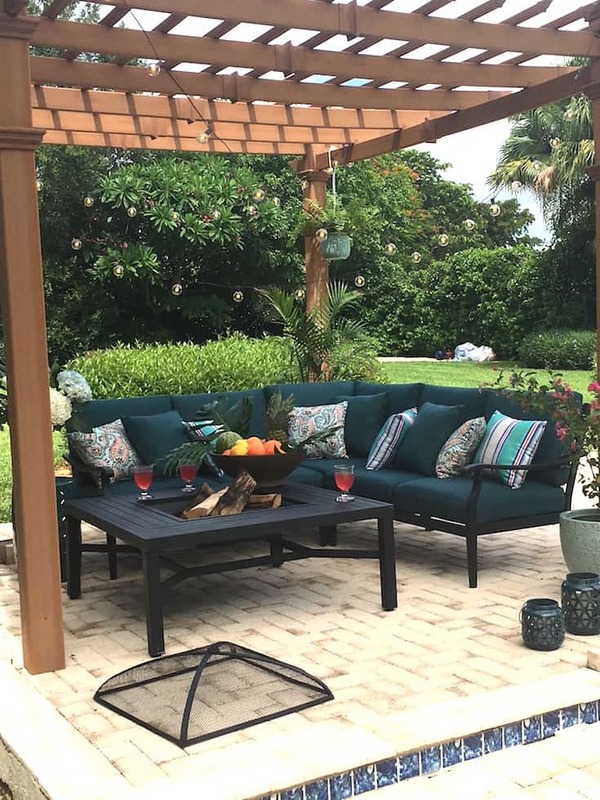 I love the Hampton Bay Sectional and the color was amazing, and the fire pit selection is full of great selections. The photo above and below via my iPhone when we worked on this project last summer. In our pea gravel patio area I styled the Beacon Park Collection and you can find it all here. Right after we shot this it started to pour buckets of rain, as it might typically do on a summer day in Miami! This collection is made to resemble wicker and is weather resistant. 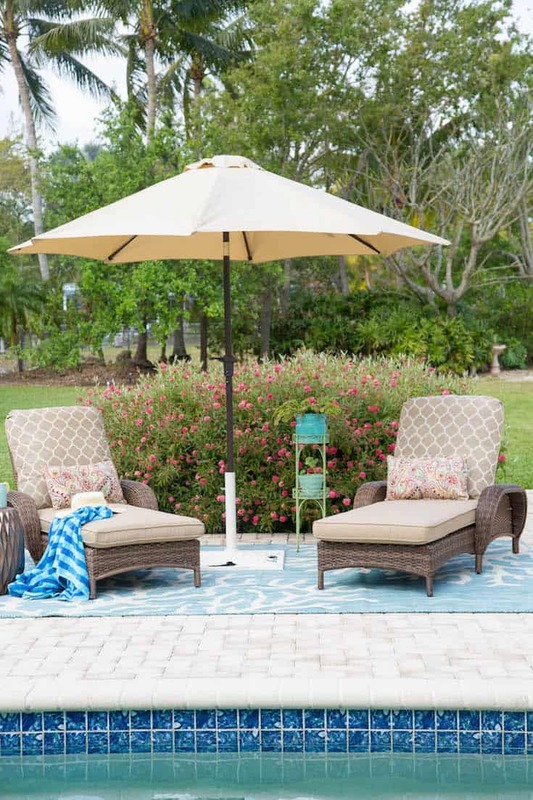 A wide shot of the entire patio style challenge reveal…and I love this new “room.” We started by adding the Hampton Bay Reef Rug that has accents that look like coral. 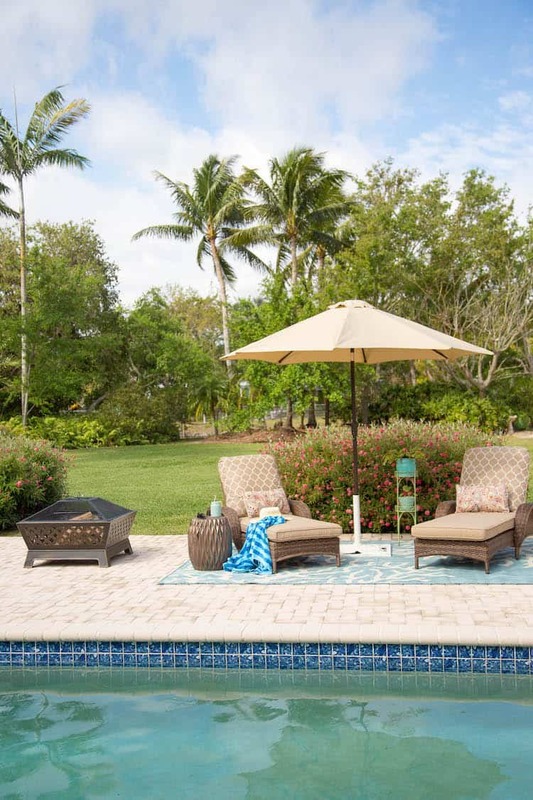 The rug will last out here and coordinates with the pillows on the other side of the patio. I think that the key to making outdoor “rooms” is to carry colors that are similar in each room. A simple trick that you might do inside your home. Neutral cushions along with pale blue pillows do that here. The Hampton Bay Beacon Park Lounge Chairs are so darned comfy for lounging. I just might have fallen asleep out here already several times! I went with a Hampton Bay 9′ Umbrella for shade and it tilts for keeping the shade on you as the sun moves along during the day. The stand is a vintage cast iron that I already had and the plant stand is vintage as well. The plants are Penta and we purchased them at the Home Depot as well. Find those here and see if they will do well in your zone, especially if you are a beginning gardener. 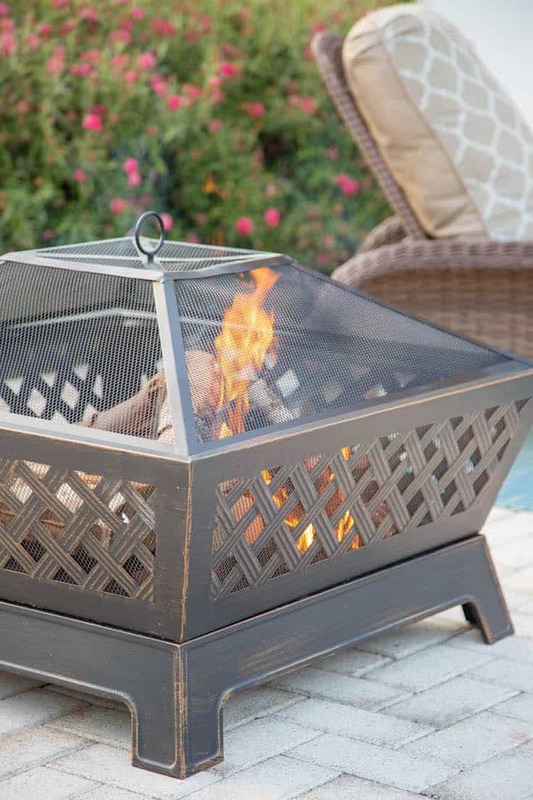 Do you prefer a wood fire pit or gas? We actually have both in our garden and I love the wood because it helps keep the pesky mosquitos away. I’m not crazy about the smell of propane either, so I’d love to know your thoughts? 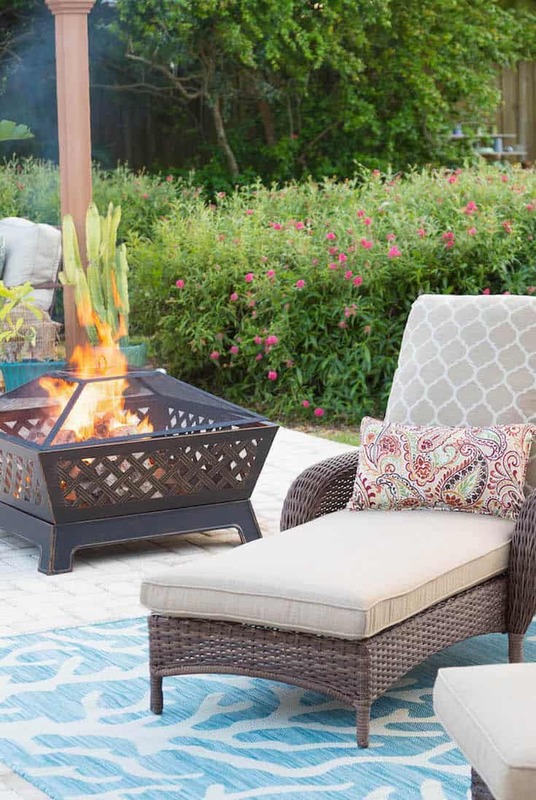 Find the beautiful Hampton Bay Tipton Fire Pit on their website. I’ve linked many of these products for your convenience within this post. Thank you to The Home Depot for partnering with us to create this space. We look forward to using it for years to come and you can see more on The Home Depot Blog! After all these years, I only j*u*s*t discovered that you have a shop on Amazon! What a beautiful stash of products you’ve chosen! 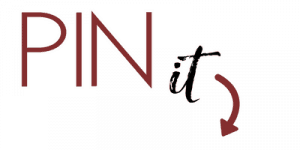 I’m going to give it a shout out on my blog and facebook page. There are things in that shop that everybody NEEDS. Janet, I think anything would look great in your backyard!! Did Home Depot build the pergola for you. It looks awesome. 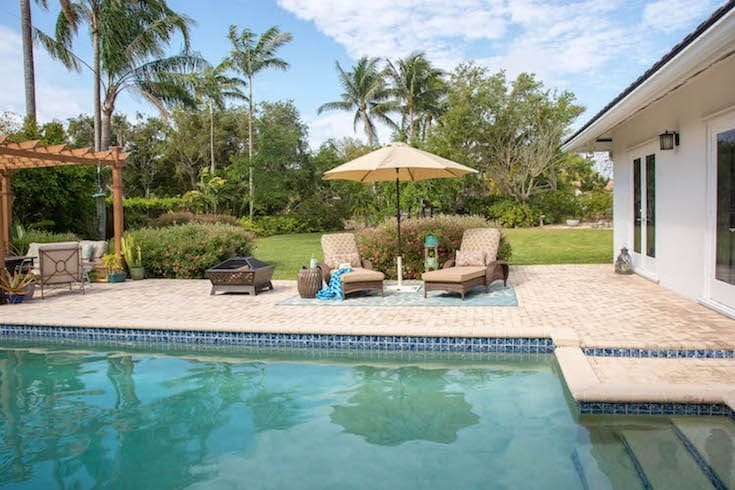 Thanks Carol…we do love our property and it’s why we purchased this home years ago! No…the pergola is from Hayneedle and put PERGOLA in the search bar to find that post! Oh Janet, it is beautiful! So pretty and I love all the colors! The color on that sectional is just divine! The rug is so my style! I love coral and that it is in coordination with the pillows is just so stunning! Awesome job! I know you’re thrilled to have all that beauty around for your upcoming and exciting event! Cheers to you! I love the new furniture! The lounge choirs look so Comfy! Boy you have a nice large lot in Miami. Hard to find nowadays! ?the wedding will be amazing there! Janet, this is beautiful. I had no idea that Home Depot carried such nice items. I love that rug and it would look great on my screened in porch. That firepit is also something I covet. We love to burn wood outside on a summer night with friends and a few cocktails. Always nice to partner with a good company. The styling turned out great and each area is wonderful. Enjoy your outside space for many years to come. You might find me lounging back here soon 😉 It’s beautiful and I know you enjoy it! Can I come live in your backyard? 🙂 I love everything about your patio style! The rug is gorgeous and I can’t stop looking at the beautiful pergola. The firepit is awesome too. Love it all! Seriously Janet you are going to look out and see me lounging at your pool! I am looking at snow this morning on the ground here in Illinois ugh!!! I need a nice lounge chair and a pool! The backyard is gorgeous. Did Home Depot make the pergola? Is that a kit they sell. We are going to be working on our backyard hopefully soon if Old Man Winter gets out of here, and I would love a pergola like yours. Everything looks so beautiful. Enjoy that beautiful backyard. Well come on down Kris and join all of our blogging friends who are tired of the snow too, lol. Seriously I think that this winter is going to have a lot of people moving to FL! The pergola is from Hayneedle and was a kit. Put PERGOLA in the search bar to find that post! Oh my gosh, I am JEALOUS of your backyard. It’s fabulous! Ours looks terrible and is pretty small. I need some better lawn furniture, that’s for sure. So pretty, Janet! We’re adding a new deck (with a pond!) to our backyard this year. I love your choices from Home Depot and will keep them on my list when it’s time to purchase outdoor furnishings! This is beautiful! I love the colors you chose for the cushions and pillows. It really looks cozy! Your back yard looks lovely. My Mom got a structure similar to one you show for her deck at Home Depot that she loved. I wish we have a pool in our backyard I can see myself relaxing to any of this patio set up. Ours has a big yard and a creek I set up some patio furniture a swing. Normally we shop either Home Depot or Lowes. I love your backyard. Ive always wanted a swimming pool in my own backyard. I love the idea of making your outdoor space an extension of your home. I will stay in your backyard all summer long, what a beautiful setting. That is something, we need to work on. I just got those loungers for my backyard space. They are still in transit. I’m so happy to see how pretty they are! Gorgeous transformation! Love your patio, I wish I had one in my home. It’s such a nice outdoors living space. WOW! Your patio is amazing! It’s like a retreat! I could just picture myself sitting there with friends sipping fun drinks! Looks like you’re all set for the summer! I love how your patio looks and the furniture that you decided to go with! It all looks so stylish and coordinated. Love it! Oh my gosh, I love all of this! It makes me wish that it would hurry up and get warm here so we can enjoy the outdoors. You have a lovely pool and patio. 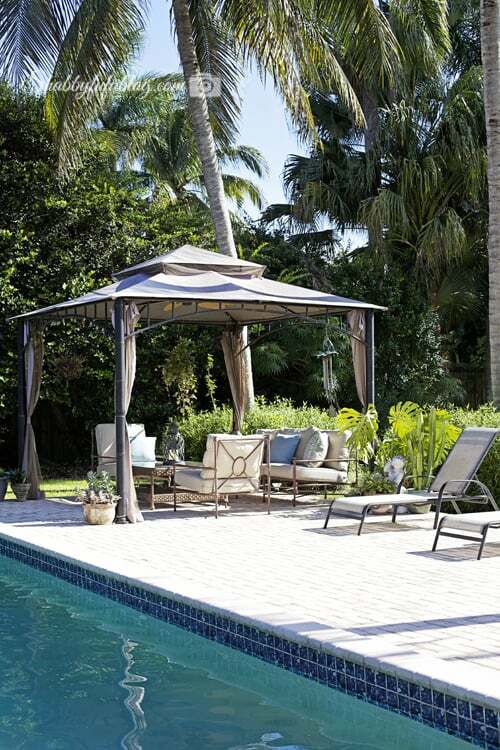 The trellis gazebo looks awesome and integrates seamlessly with the surroundings. Regarding the fire pit, always prefer the wood one. Wow! I love it. In our backyard it’s a white fence and dead grass and a cement slab. There’s no visual interest at all. I’m loving your huge yard, pool and everything you have going on! Wow! What a stunning outside space. I love everything about it. 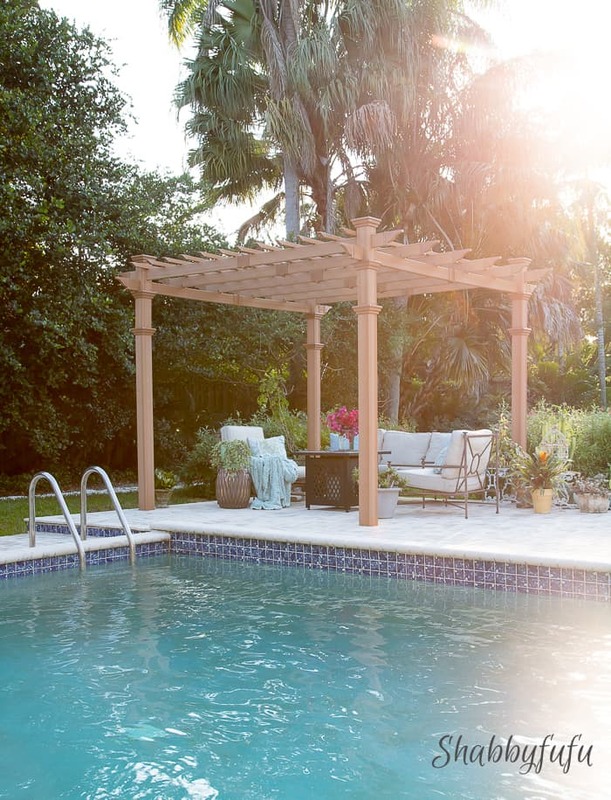 Your outdoor patio is absolutely stunning! We live in an apartment so this is super inspiring and I would totally leave the city if I had a backyard like this one! It looks beauty. I see alot of time being spent there. Wow, how I wish I have my own house with a pool too. This patio make over is so nice. I love and prefer having wood fire pit than gas though. 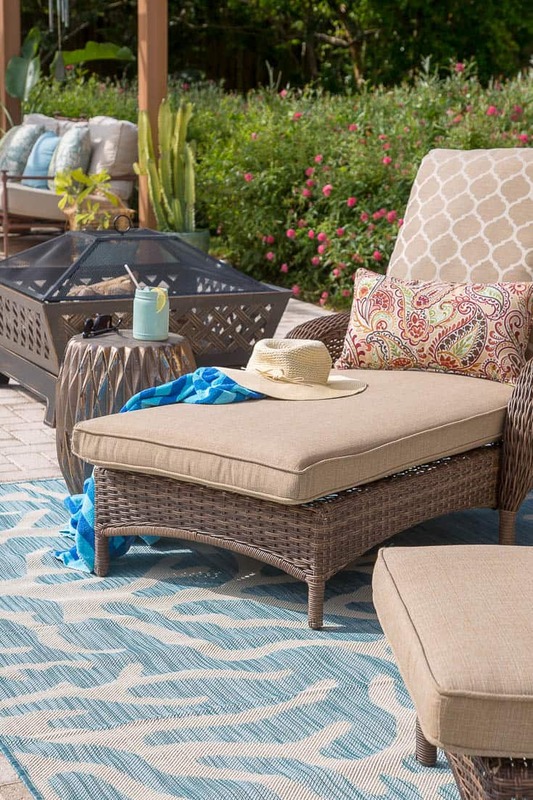 There are so many great items to buy here to make your outdoor space stylish and comfy! I love your new patio look, Janet! I remember when you shared just a sneak peak of your patio last summer and I was thinking, “Rats! Janet can’t share the patio until next summer!” Glad that Home Depot’s summertime products are ready for sharing. Really beautiful furniture!! Pinned several photos to my boards for you. Looks great! We have been looking for outdoor chaises that are comfy and not too expensive… we will have to check these out!